Friction stir welding uses frictional heating combined with forging pressure to produce high-strength bonds virtually free of defects. The welding process transforms metals from a solid state into a "plastic-like" state, and uses a rotating pin tool to soften, stir and forge a bond between two metal plates to form a uniform welded joint -- a vital requirement of next-generation space hardware. "NASA is leveraging key technologies like friction stir welding from the Space Shuttle Program to design and manufacture the Space Launch System," said Todd May, SLS program manager at the Marshall Space Flight Center in Huntsville, Ala. "NASA's advancements in friction stir welding techniques used to manufacture the external tanks give SLS a head start in development while reducing program cost, increasing reliability and creating hardware with superior mechanical properties. This technology directly supports SLS' program tenets of safety, reliability and sustainability." In the mid 1990s, following use of a new lightweight aluminum lithium alloy created to reduce the weight of the external tanks, Marshall engineers found the new alloy difficult, complex and costly to weld. Engineers researched and adapted the innovative friction stir welding process for use on the 153.8-feet-tall orange space shuttle external tanks used to hold propellant for the space shuttle main engines. The process reduced manufacturing costs, increased reliability and significantly lowered the number of defects to yield a nearly perfect weld. The Space Shuttle Program implemented the new weld technique in its manufacturing process of the external tank in 2001. The first friction stir welded tank flew in 2009. Since then, NASA has developed multiple tools and advanced processes to enhance its welding capabilities on aerospace hardware. "State-of-the-art friction stir welding will continue to be a critical technology as we continue to learn how to build more efficient space vehicles with less expensive materials," said Jon Street, welding and manufacturing lead in the Material & Processes Laboratory at the Marshall Center. "Friction stir welding yields higher strength metals with higher reliability and predictability. It also increases efficiency by reducing the number of weld passes that traditional fusion arc welding requires. In addition, it offers safer, more environmentally friendly operations than traditional welding by not creating hazards such as welding fumes, radiation or high voltage. SLS will benefit from all of these advancements." Today, the Boeing Company of Huntsville, Ala., is developing the SLS core and upper stage using the friction stir welding process. The core stage will tower over 200 feet tall with a diameter of 27.5 feet and store cryogenic liquid hydrogen and liquid oxygen to feed RS-25 engines. The upper stage, powered by J-2X engines, will be used on the evolved SLS and share common attributes with the core stage such as its outer diameter, material composition, subsystem components and tooling. 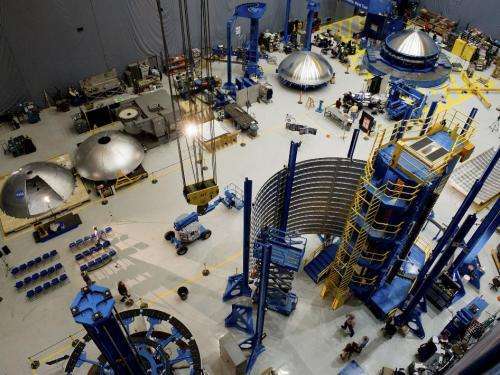 Both stages will be built at NASA's Michoud Assembly Facility in New Orleans with state-of-the-art manufacturing equipment and tooling -- including one of the largest robotic friction stir welding systems in the world. "NASAs strategy to affordably achieve a 2017 first flight for its new launch vehicle depends a great deal on the ability to leverage existing technologies and expertise, while taking advantage of the new science and innovations necessary to achieve extended flights of discovery," said Jim Chilton, Boeing Exploration Launch Systems vice president. "Friction stir welding technology meets all of those challenges."